Grow you own HRT can show you how to menopause naturally without pills, patches, supplements or changing your whole diet." I’m an ex stand up comic who had to give up her career due to a health condition and got interested in science. Then when I was hit by menopause symptoms and I started growing bean and seed sprouts because I knew they contained plant hormones. Then I thought I’d look at the scientific evidence behind it. I was astonished by what I found. And you will be too. Amazing thing no 1 is that scientists have carried out loads of experiments on plant hormones in beans and seed sprouts so they can extract them and turn them into drugs and supplements. They never mention that we can grow them and eat them ourselves. Amazing thing no 2 is that scientists have proven there is an alternative model for the way healthy women menopause. This is ignored by the HRT industry, who want us to believe that we are all deficient in hormones. Amazing thing no 3 is that plants themselves don’t contain any plant hormones. They contain compounds that are converted in hormones by our gut bacteria. Yes, we have our very own hormonal pharmacy inside us. All we have to do is feed it the right food. Amazing thing no 4 is that WE NEED those PLANT HORMONES. We evolved along side them and brand new evidence shows that our cells have special plant hormone receptors just looking for them. We’d be mad to disappoint those cells! You might have heard about plant hormones before. Perhaps you have been told that if you change your whole diet and eat tons of soya and vegetables you will be healthier. This is not another book about that. This book is about eating small amounts of bean and seed sprouts, and why they are so special. Fact no 1 is that sprouted beans and seeds, grown just for a short time contain 10 – 100 times more plant chemicals than full plants. That means you can eat small amounts to get massive effect. Fact no 2 is that you can grow them on your windowsill, without soil. It takes just 2 minutes a day to water them and they will be ready in a week. Fact no 3 is that sprouted beans and seeds don’t just help menopause symptoms, they help prevent cancer, dementia and osteoporosis and heart disease. This is not just grow your own HRT, you will also be growing your own cancer prevention. Fact no 4 is that sprouted beans and seeds are much more digestible than non sprouted food. That means we can readily absorb their rich bounty of plant hormones and other nutrients. NO WONDER THEY ARE KEEPING THEM A SECRET!!! But even finding out all that wasn’t enough. Yes, plant hormones in your diet might help you menopause more easily. But how? Exactly what is going on? Why do some women sail through menopause without a problem and others experience hell for up to ten years? Why why why? Evidence about what stops our ovaries from working properly and how growing hormone rich sprouts can help. The history of both HRT and the supplement industry, the lies, the misunderstandings and the statistics. Evidence on how some post menopausal women create their own special form of “old lady” oestrogen that nourishes our hair, skin and vaginas. Evidence on why some post menopausal women start having multiple orgasms and others dry up and wither away. Plus which sprouted foods you can to grow to avoid the latter. While I was researching this, kept asking myself it over and over again: Why does the world not know all this already? Why is it down to me to tell the world this? Why isn’t this in the mainstream? The real story is spread across a number of disciplines. The botanical industry, farming, fertility studies, ageing research, the bio matching industry and anthropological studies. The most amazing thing is that they are all saying the same thing that we evolved on plant hormones and need them. Many excellent books have been written about diet and menopause but they missed the biggest, densest source of plant hormones (bean and seed sprouts) and instead focussed on just soya. This is because soy is big business and the marketing men want it to stay that way. The pharmaceutical industry lobby hard to make sure their HRT drugs are at the forefront of medicine and that we believe their view of the world. This book references over 400 different scientific studies. Everything I am saying here has been proven by science, sometimes many times over. I had to do it this way, I am not a scientist. I have to be doubly sure of what I am saying. 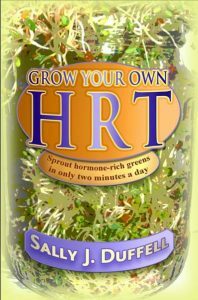 Studies have proven beyond doubt that bean sprouts and seed greens are the most wonderful source of plant hormones and other nutrients on the planet. Scientists even call them a “functional” food so good for you, they have an actual role to play in our health. History shows that sprouting used to be normal, everyone used to do it. Sprouting can not just cure menopause symptoms but other illnesses too. Even though the book is scientifically researched it written in layman's terms so that it is informative and helpful in a "best friend" type of way to anyone who is suffering from menopause symptoms. It is practical too in that I’m telling you how to grow bean and seed sprouts and a symptoms guide so you know which ones to grow. I have included the dairies of women growing their own HRT so they can pass on their stories. Do yourself a favour, start growing your bean and seed sprouts today, there’s nothing to lose, no side effects, no big financial outlay. It’s just you, some baby plants and beans and years of evolutionary history.